Saturday, April 23 -- Woodtick Wheelers “Pork Chop Feed,” American Legion, Hackensack, 4-7 p.m. Thanks to Lewie Schrupp and club members who are organizing and cooking up this great community event. The past 2 years we packed the Legion with our bullhead feeds. Want to help? Just show up! Volunteers needed to serve and clean up. Saturday, May 7 -- Spring Meeting & Pancake Breakfast. Followed by club ride to Huddles, and Adopt-A-Highway cleanup for those willing and able. See ride schedule below for details and directions. club rides to trails we haven’t ridden before! Here is all the latest news and information. Thanks for being a member! Please mail in your 2016 dues at this time. (Note: if you joined during October thru December of last year you are paid through 2016). We hope everyone continues to support the club and join us at our fun meetings, club rides and community events. Thanks to Mike Ebinger for printing and mailing this year’s dues renewal notice. Please send your dues in early. It makes our job a lot easier. Memberships are for the calendar year. And be sure to invite friends and other family members to join! Support our Business Members by giving them your business! Over 30 area businesses support our club. Stop by, say thanks, and buy something. Once again this year, we’ll be buying gift certificates from them to use as poker run and door prizes. See them all on the club web site at WoodtickWheelers.com. Trail Ambassadors Annual Meeting -- Saturday, April 2, at Camp Ripley, Hangar Conference Center, 11 a.m., lunch included. Thanks to Ed Anderson (in photo), for volunteering to be our club’s TA Grant Manager this year. Ed is creating our ride schedule for the summer and submitting the paperwork to the DNR for our club’s TA grant. Thanks to all our great TAs, who monitor the trails on the weekends to keep them safe for all riders. We hope to see you at the meeting. RSVP by March 30th to: stacey.stich@state.mn.us. ATV Safety Class Instructors Recognized -- Congratulations to our club instructors who recently received their 5-year medallions from the MN DNR. On-Line ATV Safety Training Replaces the CD -- To ride ATV on public trails, youths ages 12-15 are required to complete the MN ATV Safety online class, then sign up for a hands-on ATV class. For details and the statewide schedule, visit: http://www.dnr.state.mn.us/safety/vehicle/atv/index.html. Our club holds a safety training class each October at the WACC. There is one scheduled in Grand Rapids on April 23rd. New Club Gear -- Long and short-sleeve T-shirts in new colors! More camo caps! New camo fleece beenies! All available at the spring meeting, plus lots of hoodies, jackets, flags and more! ATVAM needs us! If you can, also join ATVAM. You get the MN OFFROAD magazine, email updates on statewide ATV news and, most important, your membership keeps Ray Bohn, ATVAM lobbyist, at the State Capitol helping us protect the ATV Dedicated Fund and move important ATV Bills through the Legislature. Join at ATVAM.org. Need a MN DNR Trail Atlas? Pick one up at the spring meeting! The 2016 atlas will be out sometime in May. Trail K’Nex Meeting -- Our club and 4 others met on March 19th at the Ironton Legion to share club information, look at maps and discuss how to connect trail systems and communities in the future. It was a great meeting! Dave Shaw and Dave Halsey attended. Looking for a cool ATV license plate? You can order a WW plate from Lone Rock Trophy. Choose from two designs. Email your plate number and Tom Johnson (a biz member!) will ship your plate directly to you. It’s just $15. Go to minnesotaatvplates.com and click on “club plates” to order. 9th Annual ATV Spring Fling -- The Central Lakes ATV Club and Cuyuna Iron Range Riders big event is Sunday, April 17th, this year at The Bridge Tavern, State Hwy 6 in Crosby. Activities and social at 2:30, speakers, dinner and door prizes at 4:30. For tickets ($15 adults, $10 kids 10/under), call Ken Irish (a WW member!) at 651-470-2601. ATV Search & Rescue Team -- Next training session is Saturday, April 30th, at the Moose River ATV Trailhead. 9 a.m. to 2 p.m. The ATV Team is assisting the Cass County Sheriff’s Dept on S&R efforts. Our Team also assisted the Deputies at the Eelpout Festival in February. Thanks to all the dedicated members on this team, to Sherrie and Darcie Gayken and Dave Shaw for leading this great community effort, and to the Sheriff’s Dept for making it happen. New Dirt Bike Manual -- Pete Peterson of Dirt Rider magazine wrote a great “how-to” book, perfect for getting your family started riding on two wheels. It’s $22 on Amazon. Before putting kids on ATVs, many parents have them take the MSF DirtBike School, where they learn balance, looking far forward and other good riding habits. Let us know if your kids want to sign up for DirtBike School and we’ll try to get one organized locally. RZR For Sale -- Woodtick Wheeler Cory Clarke has a 2014 RZR XP900 for sale. Includes full and half windshields, 5 year warranty, low miles. Contact Cory if interested at cory.clarke46@yahoo.com, or 763-516-7327. Woodtick Gear Is Worn Across The U.S. and Canada! April 23 -- Woodtick Pork Chop Feed, American Legion, 4-7 p.m. or until chops are gone. May 7 -- Spring Meeting / Pancake Breakfast / 9 a.m. at Schrupp’s Garage - Followed by club ride w/ poker game to Whipholt, and Adopt-A-Highway Cleanup (need 12 volunteers, who get free lunch at Huddles). Directions to meeting from Hackensack: East on Cty 5 for 2.5 miles, left (north) on Cty 122 for 3 miles, road turns west (Stony Drive), 1 mile to 3879 Stony Drive (before the Y). Watch for signs. June 4 -- National Trails Day -- Club Ride at Round River Trail System. Always popular! Meet 9 a.m. at Stompin’ Grounds Campground, fast and slow groups. Trails open to ATVs, SxSs and dirt bikes. Large parking area, lunch at the Lodge afterwards. Directions from Akeley: north on State 64 about 3 miles, watch for blue “Stompin’ Grounds” sign. June 25 -- Club Ride at Blind Lake ATV Trail. Meet at Swatara parking area at 9 a.m. Ride Soo Line Trail east, then Blind Lake Trail south. Open to ATVs, SxSs and dirt bikes. Bring bag lunch. Return to parking at 3-4 p.m. Directions from Remer: East on Hwy 200, a few miles before Hill City, go south on 29 (Osprey Ave), at Swatara, go left on 7 (610th Street), go a few blocks to trail parking (same location where we had lunch on Hill City ride last year). July 4 -- Club rides in Longville parade. A fun club event! Stage at Salem Lutheran Church parking lot at 10 a.m. Parade starts at 11 a.m. Decorate your ATV. Bring candy to toss to kids. July 12 -- Club rides in Hackensack Sweetheart Day Parade. Stage on 1st St. south of downtown at 4:30-5:00 p.m. Parade starts at 6 p.m. Decorate ATVs, toss candy to kids. July 16 -- Club ride at Hill City. Stage at Sunny’s Gas Station (State 200 & 169) at 9 a.m. We will ride the Hill City Trail or UPM Blandin trail, depending on trail status and group wishes. Bring bag lunch. 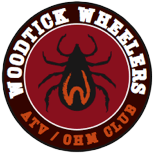 Return to trailers about 3 p.m.
July 30 -- Woodtick Wheelers Annual Meeting, Elections & Club Ride to Huddles. A one-hour meeting, followed by a fun club ride w/ poker game and prizes, to Huddles for lunch. August 13 -- Club Ride at Spider Lake Trail System. Meet at main parking lot at 9 a.m. Ride, ride, ride, with club grilling lunch afterwards at trailer. Directions from Pine River: west on Cty Rd 2 for about 11 miles, watch for state forest sign that says “Spider McKinley Road,” turn left and go 1 mile to large parking lot. You can also ride there from Hackensack or Backus. See Foot Hills State Forest map at this link: http://files.dnr.state.mn.us/maps/state_forests/sft00019.pdf. Maps also available at Backus DNR office. September 24th -- Club Ride, McGregor, MN, ATVAM Fall Ride & Rally, hosted by Up North Riders. Details to come. October -- Club Ride to North Shore - Details to come. 18 went last year and had a great time!